Howdy Ho blog visitors! 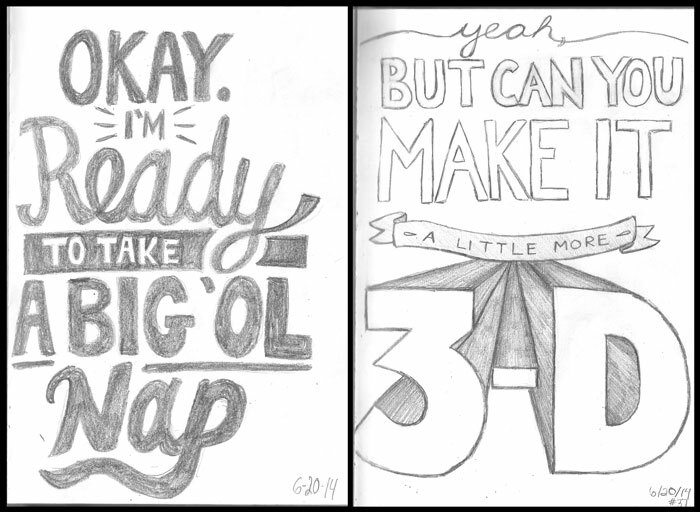 We’ve just come to the end of our sixth week of sketches here at Let’s Make Cool Stuff. Take a scroll down the page and see what we’ve been up to. Day 36: After playing through the first Act of Broken Age this week, Sean draws a scene of Shay helping out his friend in the Cuddle Dungeon. Meanwhile, Stef draws her very delicious and very alcoholic drink she had that night at Cheesecake Factory. Day 37: A long day leads Sean to sketch out how he’s really feeling, while Stef draws out the eye popping request of a rather passionate client at her internship. 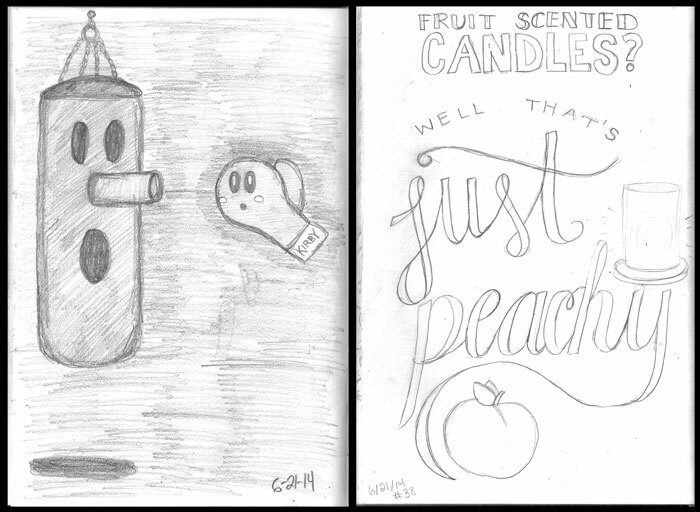 Day 38: Stef gets some inspiration from a recent candle purchase and draws some pretty peaches, and a punching bag and boxing glove turns into Kirby battling his arch nemesis first boss for Sean’s sketch. Day 39: Woof! Sean works on an idea for a brand of dog treats. 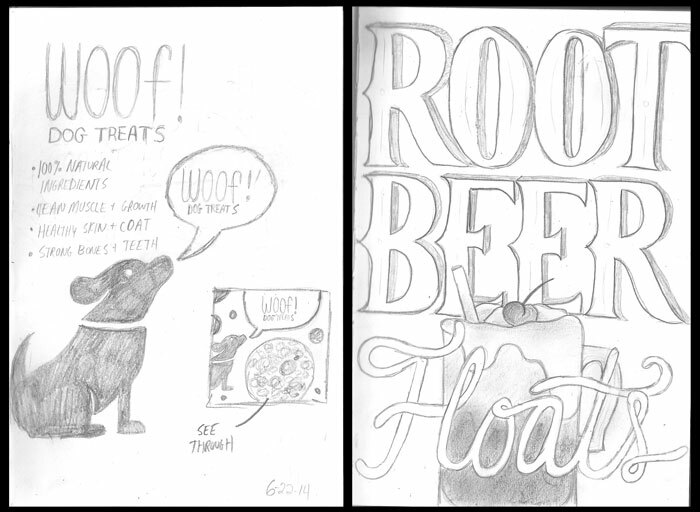 A night of Root Beer Floats gives Stef an idea for her sketch of some wonderful hand lettering. Day 40: Sean mashes up American Dad with Life Aquatic and gives Klaus the signature Zissou treatment (Red Cap and Glock). 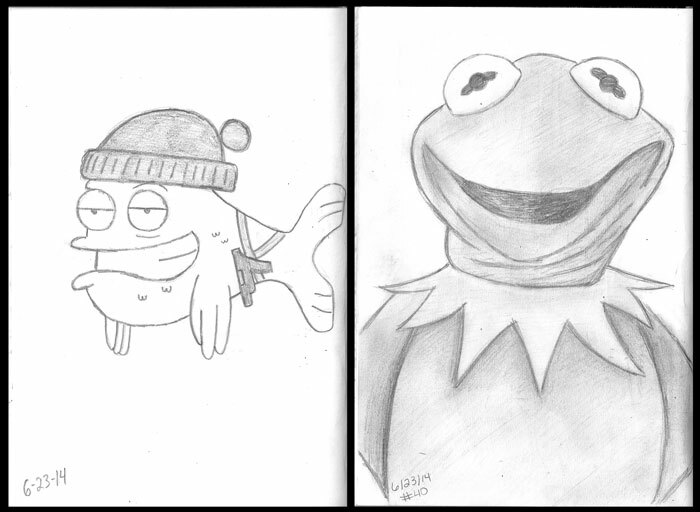 Stef takes a lot of pride in her shading, and she proves it today with this stunning sketch of Kermit the Frog. 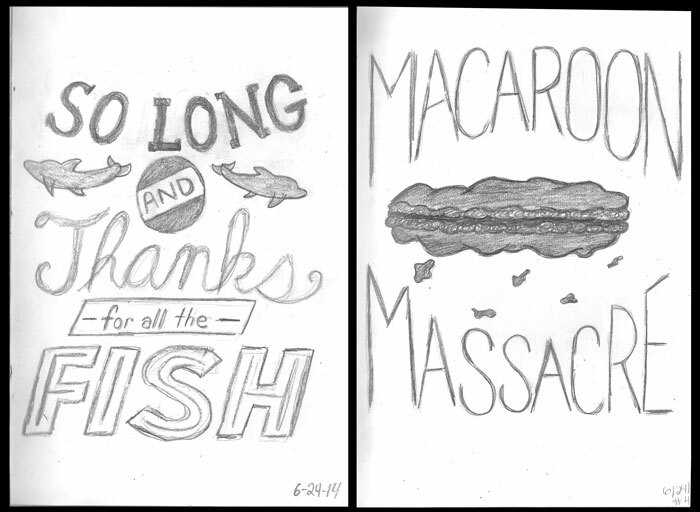 Day 41: The dolphin singing antics of Hitchhiker’s Guide to the Galaxy has Sean sketching some more sea creatures. Stef recovers from a tragic day of trying to make macaroons (a blog post that won’t see the light of day just yet unfortunately) with these sad looking cookies. Day 42: ***Theme: Birds! ***A small ceramic owl from Epcot gives Sean the inspiration for this week’s theme. 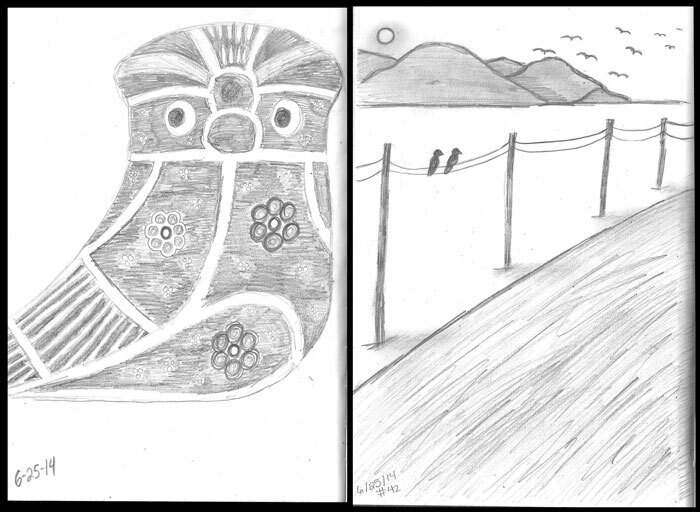 Stef lets her creativity fly with her sketch of a couple birds taking in the view. And so Week 6 comes to a close. 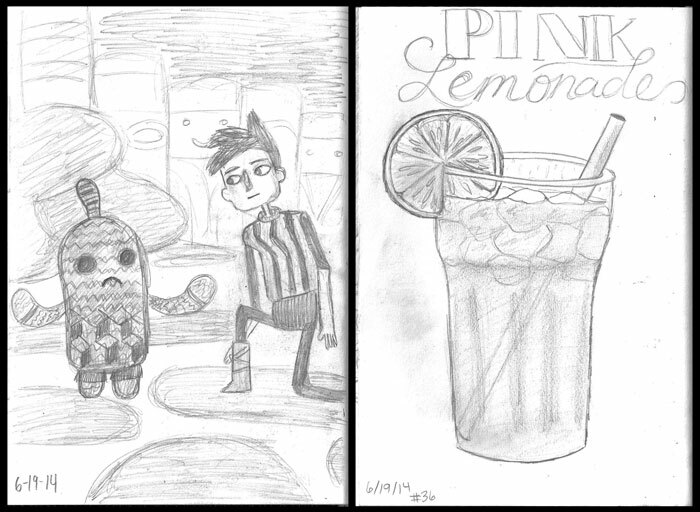 I felt we both had another pretty strong batch of sketches, and we were both relieved to have finally gotten our Peach Raspberry Cobbler post up this week as well! We hope to have more posts up on the blog soon, so keep checking back for more updates. See you next week!